If you are relocating internationally, our team of international movers in New York can help. Our East coast office is located just a short distance from the New York Harbor. Thousands of containers of household goods leave our warehouse and our job is to make an international move as painless as possible for our customers. New York is one of our busiest locations in terms of volume for container shipments: especially for our LCL, or shared container services. If you're looking for a way to cut the costs of an international move from New York, our specialized shared container service offers highly competitive rates and leave every two weeks depending on the final destination. From our warehouse, we not only service New York City, Manhattan, Brooklyn, the Bronx and Jersey City but also the entire states including major cities and many smaller towns. Additionally, our east coast operations directly serve much of the north-eastern states. So if you are planning an international move from one of these, we'll easily be able to pick up your items. WE ARE NOT A BROKER. Our own crews, vans and trucks work from of our warehouse location in Elizabeth, NJ. 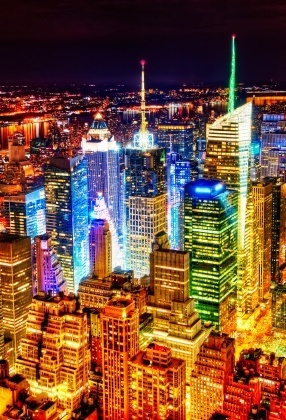 Everyone knows that NYC is the city that never sleeps and can be a little intimidating when trying to navigate and plan for an international move. Schumacher Cargo uses our small fleet of vans for picking up your effects so that we can limit the effect of the traffic congestion in the major urban areas and increases our scope of flexibility when it comes to collecting from apartment complexes and high rise buildings. Very few international moving companies can match what we offer. We are with you from the point of pickup to the point your personal effects are delivered to their final destination. It's as simple as asking us for a quote today!! We not only take the stress away from you, but we're able to offer very competitive groupage rates for families and their personal effects no matter where they are moving from in the greater New York and New Jersey areas. For those in need of additional relocation services, we also specialize in moving cars, vehicles, individual furniture, antiques and/or other goods from New York. How Long Does it Take to Ship Household Goods from New York? Generally, it takes around three to four weeks on the ocean depending on where your final destination is. As international movers, we've worked hard to acquire contracts with all the major shipping lines, as well as our own direct groupage rates. If you need to transport a vehicle either to or from New York, they are usually shipped in individual containers, but quite a few sea carriers permit partial containers with a mix of household goods. Please take the information as a guideline. It's something that can be discussed in more detail during the consultation process with a specialist.